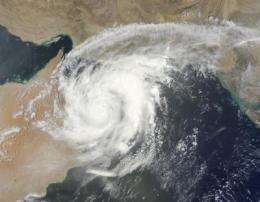 Tropical Cyclone Phet made landfall in Oman on June 3 and is now back in the Arabian Sea and headed toward a second landfall in Pakistan this weekend. NASA's Aqua and Terra satellites have captured infrared and visible views of the storm. NASA's Terra satellite captured a visible image of Tropical Cyclone Phet on June 4 at 06:40 UTC (2:40 a.m. EDT) that showed the lack of an eye, indicating that the storm had weakened after making landfall in Oman. Shortly after Terra flew over Phet, NASA's Aqua satellite passed overheard and the Atmospheric Infrared Sounder (AIRS) instrument onboard captured an infrared image of Cyclone Phet at 0947 UTC (5:47 a.m. EDT). 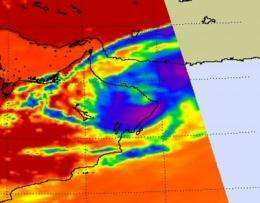 The image showed that Phet''s center of circulation was leaving the Oman coast at that time. The infrared image also revealed high cold thunderstorms that surround it are as cold as -63 Fahrenheit. When Phet made landfall in Oman on June 3, it caused landslides and floods in the eastern part of the country. After landfall Phet weakened and continued heading in a northeasterly direction up Oman's coast and back into the Arabian Sea. No casualties have been reported. On June 4 at 1500 UTC (11 a.m. EDT), Tropical Cyclone Phet's maximum sustained winds were down to 65 knots (74 mph) making it a Category One cyclone on the Saffir-Simpson Scale. That's down from the Category Four cyclone it was before it made landfall yesterday. Phet is now 65 miles southeast of Musqat, Oman, near 22.9 North and 59.5 East. It's moving north-northeast near 6 knots (7 mph). Tropical Storm-force winds extend out to 115 miles from the center, so the storm has grown in size since it made landfall. It's now 230 miles in diameter. Phet is still creating dangerous surf in the Arabian Sea, where waves are 22 feet high. All fishing boats and other water craft have been advised to stay in port. Phet is forecast to continue moving in a north-northeasterly direction over the weekend, and residents of Pakistan are bracing for the storm's arrival on June 6.